Politically, environmentally, culturally, economically—this has been one of the most tumultuous times in modern history. For many it has felt like the fire, so to speak, has been getting dimmed. Starting July 30, Think Tank Gallery will be launching a series of immersive art activations on Melrose Ave drawing Angelenos into a full on revolution to ‘steal the fire’ back. This will include a fully functional Molotov cocktail vending machine (only $5! ), a lemonade stand that sells lighter fluid and custom zippo lighters.These activations will be the lead-up to a group art show called We Stole the Fire opening on August 4th at RCNSTRCT Studio, featuring well known political artists like Robbie Conal, Phil America and twenty others. “What’s More American Than Violence?” is a sculptural installation and series of dysfunctional art objects inspired by Edward Abby’s “The Monkey Wrench Gang.” The installation features a fully-functional molotov cocktail vending machine, full of converted Mezcal El Silencio bottles, customized with a limited edition, hand signed and numbered, spot-UV instructional art sticker, and custom “STEAL THE FIRE” bandana, each designed by artist Phil America and designer/Think Tank Gallery Art Director Dino Nama. The piece seeks to call attention to the ease of access to deadly weapons in America, and a large portion of proceeds of each sale are donated to Everytown (a non profit advocating deeper gun license background checking regulations). This series is limited to 200 bottles available online for $55 each, and an extremely limited amount available for $5 at the vending machine on Melrose Ave, released at an undisclosed date and time leading up to and during the We Stole the Fire art exhibition on August 4th. The same day, the nearby newspaper stand that has seen legendary pop ups and murals from artists like Shepard Fairey and the photographer JR will be repurposed as a lemonade stand that fills lighters and sells hand-carved zippos. For the full week of July 30 before the group art show, passersby on Melrose will have access to all the elements needed to assemble a revolution. Open 3-9pm through Saturday. Representing the billboards that surround us in everyday life, Think Tank Gallery placed an abstract take on the advertising canvas in DTLA mid-July, and Mezcal El Silencio has commissioned artists from the show to reconceive it with a new mural each week (the above is by Deladeso and Tofu). On August 2 it will appear inside RCNSTRCT Studio and be visible through the window, completely transformed by half a dozen artists’ murals. Following the week of guerrilla activist installations on Melrose will be a four day group art show opening August 4, 2018, curated by Think Tank Gallery. After the week long ability to gather Molotov cocktails, lighter fluid and lighters, the revolution will burn to its inevitable conclusion during the art show’s opening reception held from 6pm – 11pm. Confirmed artists include Phil America, Sheryo x The Yok, Lolo YS, Abars, Willie Gomez, Kristen Liu-Wong, Robbie Conal, Teddy Kelly, Deladeso, xTOFUx, Scott Hove, Homeless Cop, Gangster Doodles, Ginger Q, Nicole Salgar, Dorian Lynde, Alec DeMarco, Samuel De Angelis, Ray Young Chu, The Portalists, Jon Von Bonk and Roman Prado. Think Tank Gallery (with co-curators Jacob Patterson and Andrew Barsoum) and artist / creative director Phil America, in collaboration with El Silencio Mezcal, are thrilled to announce We Stole the Fire, an art experience on Melrose Avenue engaging the people through participative activations, graffiti, performance art, installations, and a limited edition merchandise campaign. This will place participants at the front-line of the revolution to reclaim our imaginations from the modern gods of government and media. Following the guerrilla activist installations will be a one-nightceremony and three day group art show opening August 4, 2018, curated by Think Tank Gallery. Confirmed artists include Phil America, Sheryo x The Yok, Lolo YS, Abars, Willie Gomez, Kristen Liu-Wong, Robbie Conal, Teddy Kelly, Deladeso, xTOFUx, Scott Hove, Homeless Cop, Gangster Doodles, Ginger Q, Nicole Salgar, Dorian Lynde, Alec DeMarco, Samuel De Angelis, Ray Young Chu, The Portalists, Jon Von Bonk andRoman Prado. More will be announced as they are confirmed. The art show will be held on August 4 from 6 – 11pm, and August 5 through 7th from 11am – 5pm at RCNSTRCT Studio at 7400 Melrose Ave, Los Angeles, CA 90046, on the corner of Melrose & Martel. Every experience will give audiences a chance to fully participate or follow along on social media as they please, but the programming will be incomplete without audience contribution. The entire street campaign will be documented on 35mm by Think Tank Gallery Lead Photographer, Willie Gomez, culminating in a zine and gallery photo series. In most cultures around the world, fire has always been something mankind has stolen from the gods in order to create civilization. This was true in Greek mythology, as well as Mexico’s, where fire was used to create mezcal, known as the holy elixir for its ability to sustain life. Centuries later, the old gods of mythology have been replaced by new powers—the government and the media—who use their magic to manipulate the populace. We Stole the Fireaims to re-ignite the same revolutionary defiance that spawned human civilization, so The People can now reclaim their imaginations and overcome this time of immense political, cultural and environmental turmoil. 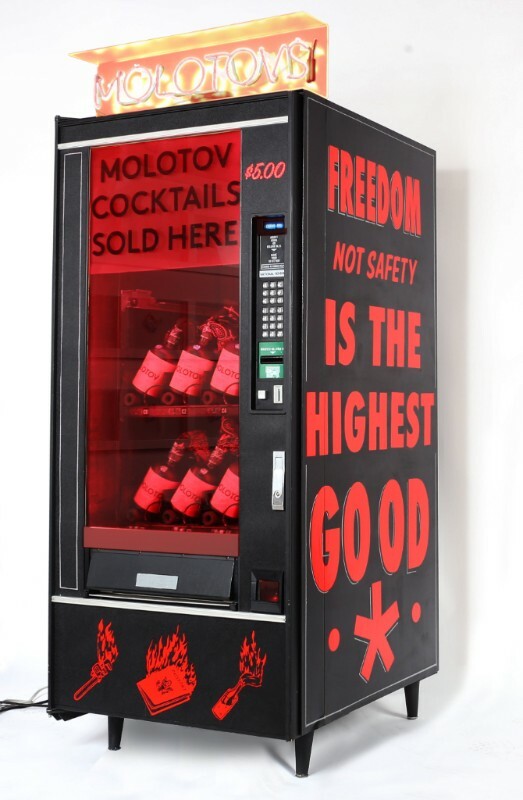 “A molotov cocktail has never been thrown to maintain the status quo,” says Think Tank Gallery director and curator Jacob Patterson, and that truth reverberates through the entire month of July. Lead by Phil America, the three-part durational immersive programming of We Stole the Fire will begin unfolding on the heart of Melrose Avenue before the opening of the show. 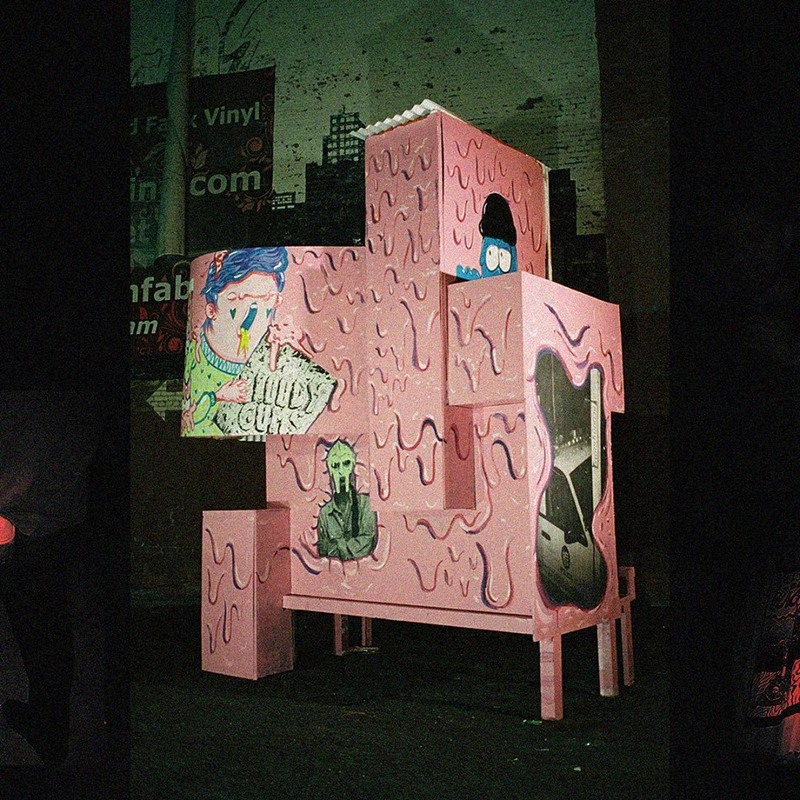 It will launch with the mysterious appearance of an abstract street sculpture designed to steal the flames of advertising from the public space around it, that passersby are invited to mark however they like. Over time, artists hand-selected by Think Tank Gallery will also add their unique voices to the sculpture. Passersby will also discover a fully functional Molotov cocktail dispensing machine, and later, a newspaper stand that has seen legendary pop ups and murals from artists like Shepard Fairey and the photographer JR, now repurposed to fill lighters and sell hand-carved zippos. 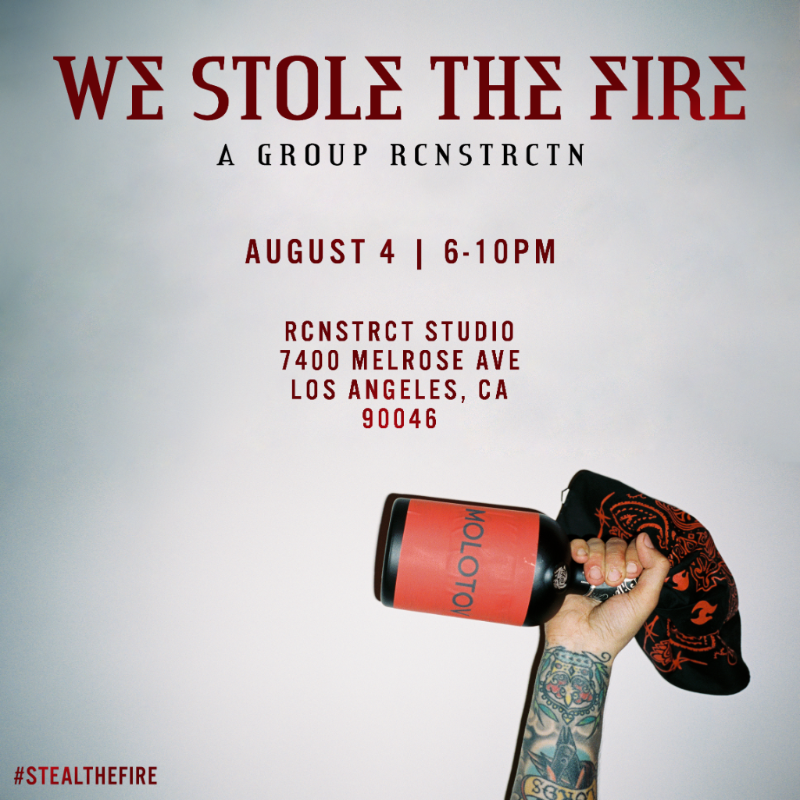 These experiences will culminate at the opening reception of the We Stole the Fire group art show on August 4, 2018 at RCNSTRCT Studio, where the revolution will burn to its inevitable conclusion. The show will feature over 20 artists. 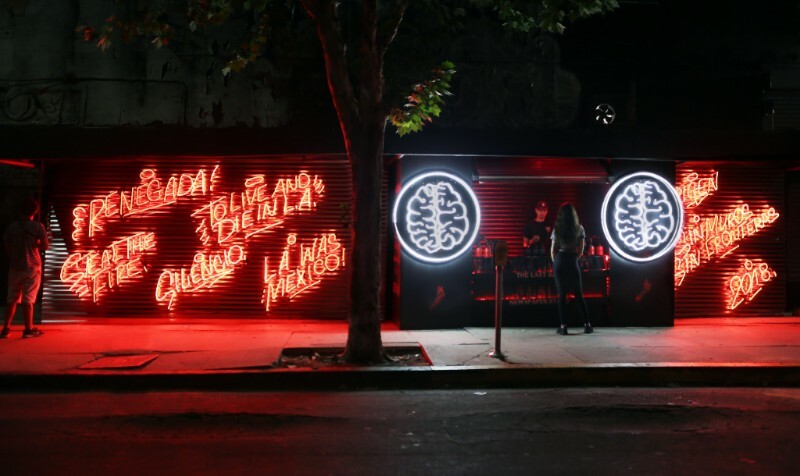 Devoted to promoting free speech and expression, Mezcal El Silencio has been a long-time supporter of Think Tank Gallery’s immersive art exhibitions, including escape rooms and west coast themed art shows. Their most recent collaboration was a site-specific performance during Derby Day at the Santa Anita Race Tracks, where an artist took over a century-old information booth at the park and gave advice on how to bet on losing horses, while mixing a signature Silencio Mule. We Stole the Fire will be Mezcal El Silencio and Think Tank Gallery’s most involved collaboration to date. We would like to thank Hijinx Artist Management & PR for the invitation and press release to this event.